I usually travel with three or four rechargeable gadgets, including a Palm PDA, my iAudio 7 media player, and my cell phone. These all charge with from a USB port, so I naturally thought about finding a portable, rechargeable "power brick" to carry with me. At first, I bought a Vector CPI20P unit (see below,) but I had problems with it. I then found this unit on eBay for a very reasonable price and I've been pleased with it. The unit is much smaller than the CPI20P...about the size of a pack of cigarettes. 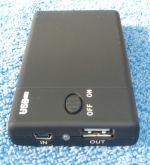 It charges from a mini-USB connector and has a standard size USB jack for operating devices. The unit is advertised as having about 2600 mAH of power, though I have no way of testing it. In practical use, it will easily charge my PDA and media player, though it labors a bit to keep my cell phone charged. When I watch movies on my Palm, the unit approximately doubles the playing time. It takes about four hours to recharge the unit from a wall-bud USB charger, and slightly longer to charge it from a laptop USB port. There is a single LED to show charge and charging status. On the top of the unit, there is a simple sliding switch to turn the unit on. As far as I can tell, the unit will automatically turn off when the batteries discharge below a certain point. One good/bad feature is that the unit comes with a wall-bud USB charger, a retracting adapter cable, and about six adapter tips to allow the unit to interface with different devices. To be honest, I don't even recognize half of the adapter tips. I would have preferred a simple wall-bud charger with a mini-USB connector. QUALITY: Quality of construction is fair, but not outstanding. Unit operates as advertised. PERFORMANCE: Just about doubles your operating time and charges in just a few hours. PROS: Compact and lightweight, operates most portable devices without problems, uses standard USB ports to both charge itself and operate devices. CONS: Does not have as much charging capacity as I would like, comes with a wide (and confusing) array of adapters to use with different devices. VALUE: The unit cost less than $10 and is a bargain. OVERALL OPINION: If you need a portable power brick to keep your devices running when you're on the road, you could do a lot worse than this. Back to list of miscellaneous gadgets. This can solve a couple problems for you, if you travel quite a bit. More and more hotels have wifi service in the guest rooms, but many still do not. The Netgear Travel Router is nothing more than a compact router that converts your data port in your room to a wifi 802.11b/g network. It can provide a secure wireless connection with your laptop or wireless PDA (something that can be configured in advance) and then establish the connection to your room's internet service. Why work at that crappy desk in the corner? Now you're free to surf in bed or even out on the terrace. Plus, take it home and it makes a handy auxiliary router to be used on a hardwired LAN. If you already have broadband service and a router, this could work as your only wifi access point...just take it with you when you travel and then plug it back in when you get home. QUALITY: Compact and lightweight, no problems with it so far. PERFORMANCE: Not as strong a signal as with a "real" wifi router, but more than adequate in most circumstances. Administration is quite easy. PROS: Small, light, reliable, easy to administer, comes with a neat case. CONS: Not as powerful as most wifi routers. VALUE: This cost me less than $15 and was worth every cent. OVERALL OPINION: A very handy tool if you travel and want to use wifi around the hotel. This is the perfect complement for a nice pocket tool. This flashlight is only about the size of a quarter, but it really puts out some light. What's more, it has some "intelligence"...it's capable of being dimmed to conserve battery power, turned on momentarily, and functioning in one of four flashing (strobe) modes. The strobe mode is particularly helpful if you are working in a darkened area with your pocket tool. Just turn the light to strobe and you can lay your tool down without fear of misplacing it. The same thing applies to camping. Battery life is pretty amazing, considering how bright it is. I've had mine for over two years and I've only replaced the batteries once. It comes with several accessories, including a spring-loaded clip that will hold it to your clothing or to the brim of a hat for hands-free operation. The glass-filled polyurethane body is rugged and the textured surfaces allow you to maintain a good grip on it even when wet. The unit is water-resistant (I'm always reluctant to agree that ANYTHING is water-proof, as water is so darn smart) and seems impervious to rain, sweat, or momentary immersion in water. I once bought an LED flashlight that was a "knock-off" of the Photon unit and was sorely disappointed. Make sure you get the real thing if you want a quality flashlight. QUALITY: Very high quality. Case opens easily but seals well when servicing battery. PERFORMANCE: Excellent light output for such a small light. Vastly superior to many of its imitators. PROS: "Intelligent" design with multiple operating modes, does not turn on accidentally in your pocket, excellent light output, available in many colors of LED (red is helpful if you're working at night), case seals well, uses batteries available just about everywhere, holds up to being knocked around by tools and change in your pocket, textured surfaces help you to distinguish the operating button in the dark, accessories are helpful in securing the light to your clothing or cap. CONS: Batteries may be expensive if you buy them a drugstore, no auto-off feature, can be expensive (so shop around). VALUE: Very good flashlight, even though it costs a bit more than you might expect to spend (around $15). OVERALL OPINION: I love mine and it goes with me wherever I go. I bought this unit to keep my portable devices charged while on the road where there are no outlets. Vector is a major manufacturer of inverters, so I thought this would be a quality product. I did not even realize until after I bought it that it has both a USB port and a 120VAC outlet. Yes, that's right...you can plug a wall-bud charger into it and it will charge any small device you have, though for only about 20 minutes. The unit sort-of-works as advertised, and I'm not quite happy with it. First, it takes a looong time to charge using the included wall-bud charger. In most cases it takes nearly 24 hours to reach full charge. Second, it does not seem to hold a charge, even when it is not in use. If it sits unused and uncharged for even two days, it will not turn on. Third, it is much bigger and heavier than is convenient to carry in a laptop bag. If you look at the pictures, you'll see that the craftsmanship and construction are above average. There is a pushbutton on the side to turn the unit on and off. Two LEDs on the end show the charging and operating status. There are two connections on the end, the 120VAC (non-grounded, of course) jack and a USB jack. The finish on the unit is a non-slip rubber that really does keep the unit in place. It is much bigger than my other power bricks, though this is to be expected, since it provides 120VAC. The internal charging circuits and logic are quite sophisticated, making it very easy to tell the unit's status. Unfortunately, since it takes so long to charge and doesn't seem to want to hold a charge (trust me, I've tried charging it from other power sources, discharging it and cycling it, etc.,) it's not really of much use to me. I use it occasionally, but not very often. QUALITY: Very good construction and finish, rubber coating is especially nice. PERFORMANCE: Maybe not an "F," but certainly no higher than a "D-." It just won't hold a charge. PROS: Beautifully made, great status indicators, durable, has 120VAC outlet. CONS: Big, heavy, charges very slowly, and won't hold a charge. VALUE: I got this at a great discount, but I'd rather have the purchase price back. OVERALL OPINION: Great concept and construction coupled with very poor performance. Look elsewhere if you need a rechargeable power brick. A handy piece of equipment under certain circumstances. If you can't afford a Fluke Scopemeter, then you might want to consider a Velleman unit like this HPS10. It doesn't have the quality or the capabilities of the high-end Flukes, but it's fairly cheap and pretty reliable. At a fraction of the cost, it might be all you really need. It has a 10MHz sampling rate and up to 2MHz analog bandwidth. The full auto setup function makes it pretty easy to use, but you need to know something about how to use an oscilloscope before you try to use this one. Along with the scope functions, it will double as a DMM, though it is a bit clumsy to use in that mode. It's battery powered, but works great with an off-the-shelf 9 VDC power supply. The HPS10 does not come with a case, but one is available from Velleman. This model also does not have the data port that some other Velleman models do. The instruction manual is sort of spotty, but adequate for most needs. Don't expect a lot of explanation about what an oscilloscope actually does. QUALITY: Not as nice as a Fluke, but nothing to be ashamed of. PERFORMANCE: Works fine and appears to be accurate. The auto setup is smooth and locks right in on the signal. It would be nice to have better resolution on the display, but you have to sacrifice something, I guess. PROS: Inexpensive, reliable, easy to setup (as long as you know what it's for). CONS: No case, low resolution display, limited bandwidth, no data port. VALUE: Fluke Scopemeters are usually at least $1,000. This Velleman isn't. OVERALL OPINION: Nice to have as a second scope that runs on batteries. I probably wouldn't be happy with it by itself, but some people might, if they have limited test needs.